A pretty important rule in the process of decluttering a house is that you do not bring new stuff in as you are taking old stuff out. The goal is to eliminate duplication, focus on function, and keep like with like: not 'go shopping in thrift stores and fall in love'. But... sometimes you just have to give in. This happened at my favourite thrift store in Port Colborne, where I've been going with friends every summer for a lovely afternoon in the lakeshore park there (I'm sorry not to remember the name of the shop, but of the two thrift stores in town, both are excellent, so perhaps it doesn't matter). The retail area had been renovated and expanded since my last visit but the kinds of things in it are the same: it's all stuff decluttered from the homes of longtime residents of the town, well-loved and always special. The blankets were what did me in really. 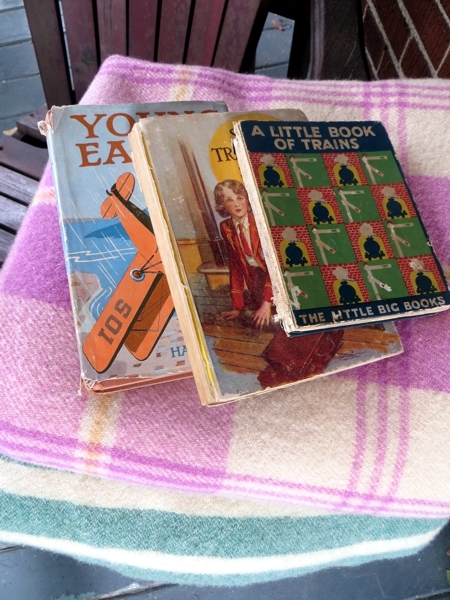 I looked at many things I wished I had space for, but then I remembered how cold nights were at the cottage in early summer and thought perhaps I should check for wool blankets. 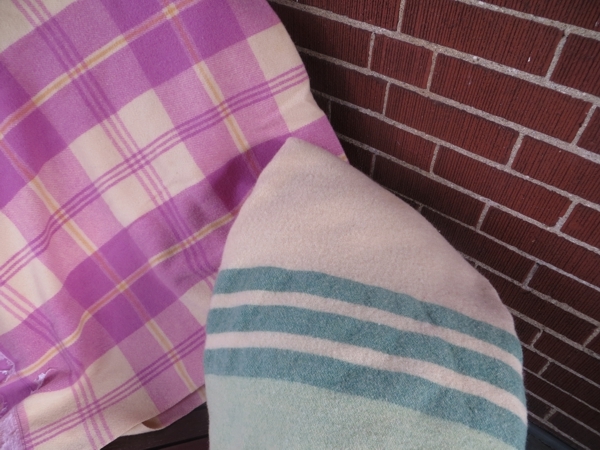 The pink plaid one, which is almost completely square and keeps asking me to take it for a picnic, was I think $2; the larger green one, about a double-bed size, was $4. Neither has any moth holes or stains, but they are both missing their wide satin borders. If I don't give in to the urge knit or crochet a special replacement border, I am pretty sure I have some fabric kicking around that would look pretty awesome as blanket edges, ahem. 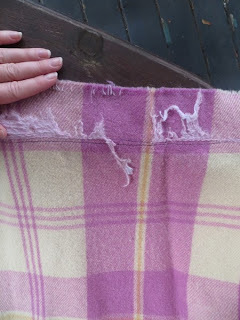 Frankly though, if you are using them for warmth and not Pretty, you can just layer a blanket like this between a top sheet and a better-looking blanket. No one will know, and you will be toasty all night long. I never have to pay more than about $8 for an old wool blanket in a thrift store, and since the worst thing that can happen to one (felting) turns it into fabulous sewing and crafting material, I put them right into the washing machine as soon as I'm home - hot water, gentle cycle if I think of it, soap for delicate fabrics. From there, they go into the dryer. If you've ever watched your mother or grandmother send these things off to the dry cleaner I'm sure that sounds crazy, but if there were any bedbugs or moth eggs or other nasties in there, you won't have to worry about them any more. And actually, if anything they only come out a bit softer than when they went in. One of the blankets I handled this way did shrink up a bit, but it didn't felt. I think they must all have been treated with something to protect them from any clumsiness as regards washing. 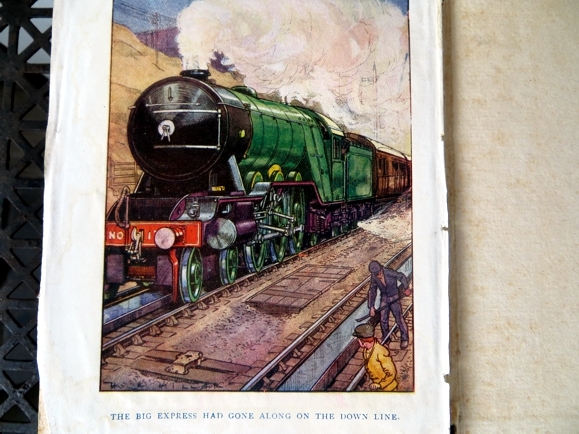 Apart from the obvious reason to buy old books - the cover art! - there is a certain nostalgia factor in letting old books into your mostly decluttered home. Judging from the publication dates and the personal note in the airplane adventure book, these books were all owned by people who were born in the late 1910s or early 1920s, and then kept on. Until, of course, they were given up to the thrift store by somebody like me, probably, who just really needed to clear stuff out. 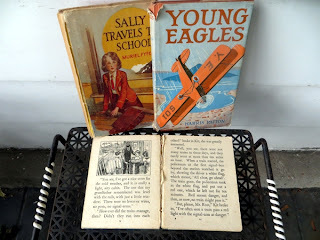 It made my heart ache a little to think of the children who'd loved them and since grown up and grown old, perhaps having left their homes at last for geriatric care, or simply having died. Love love love it: it's just so 1920s. 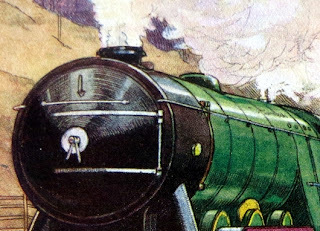 And also, what a gorgeous colour combination that would be - bottle green, yellow, and black. Man hat? Gah, gotta stop thinking about new knitting projects. And that's enough book-gazing for now too - go have a good day and fingers crossed for some knitting for all of us!